The Origins Award–winning board game from James Ernest comes to your gaming table in a new full-color, high-quality deluxe edition featuring components on par with the best European board games. Kill Doctor Lucky pits 3 to 7 players against each other in a race to see who can kill Doctor Lucky. The trick is that all the other players want to do it first and will stop at nothing to prevent you from having the pleasure. And the old doctor has earned his nickname well: he's got more lives than Rasputin and an uncanny knack for dodging your best traps. But his luck can't last forever. Before the game is over, someone is going to kill Doctor Lucky—wouldn't you rather it were you? Everyone starts in the Drawing Room, and everyone wants to kill Doctor Lucky. Players move around the mansion looking for weapons and trying to catch the old man alone. Trying to kill the Doctor is pretty easy, but every other player can play Failure cards to stop you. Doctor Lucky's luck runs out eventually, though, and you just hope you can catch him when it does. This new edition now includes the "...And His Little Dog Too!" expansion—three rules variants that feature Doctor Lucky's dog, Shamrock. He's just as lucky as his master and has an annoying habit of making you feel fond of him. Some games have you searching for clues to solve a murder, but what about the people that think the actual murder would be more fun? In Kill Doctor Lucky it’s up to you to gather up your weapons, elude the other guests, and brutal murder the old geezer…just make sure there are no witnesses. The most tricky part will be catching him though. Pretty spry for an old ****. The game is a ton of fun. It’s not super deep, but it does require some tricky strategy and planning. Now, this doesn’t mean your plan will come together. Everyone else will be trying to enact their plans as well and they probably don’t coincide with yours. You move the old guy to the wine cellar and wait for him…to bad. Someone else pops him up to the armory before you even get a chance to make your ambush. You can’t even attempt to murder someone while they can see you. This means usually staying away from the other players. It leaves you open for an attack but it also gives them a chance at victory as you can’t watch them. The doctor moves on a very predictable path, that is until someone changes that. Before every players turn, the doctor moves to the next higher numbered room. He will keep moving in this circle around the house unless someone plays a room card and prepositions him instantly in another room. From there he will continue on his way, moving to the next higher numbered room until he reaches the end and starts back over at the first room. This is a big part of the game. Be where he will be, move him to you, or move you to him…and all of this with no witnesses. A nice addition to this game that I didn’t expect, when the doctor moves into a room that is occupied by another player, that player then gets the turn, even if they were not the next player in line. This adds a whole new level of strategy to the game that I was quite pleased with. When you finally get your shot at offing the old coot, all the other players get one chance to stop you. They do this by playing Failure cards. If they can make the failure points add up to the total of the weapon card you are using, your murder attempt gets thwarted, but all is not lost. A failed murder is hard on a character and might get them a little miffed. This miffedness represents its self in the form of a spite token. You get one after each failed murder and these add a +1 bonus to all your next attempts. Practice makes perfect I guess. 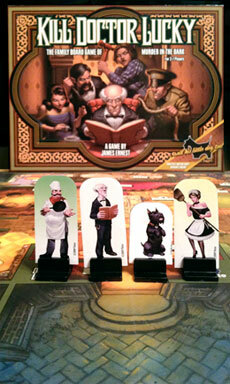 -Easy to understand rules, even though I overlooked a few details on the first play through. We fixed it half way through the game though. -Could use some new expansions to add a few extra new things to the game. Simple is great sometimes, but a little extra options are always good. -Miniatures would be great with this game, but that would raise the price up from a very good, affordable spot where it is now. I really liked Kill Doctor Lucky. It’s easy to learn, pretty simple to play, and just enjoyable. There really isn’t to much to dislike about it. The price is right, the play time is right, it feels original enough that it will be able to provide something new, and quite frankly the old dude might just have it coming. Right? From the outset the art on this game is a big draw. The image on the box lid is fantastic and humorous and a good indication of the rest of the game. The instructions are simple enough to understand and easy to follow, it took only a couple of turns for everyone to decide that the rules can be put away! The board isn’t among the best quality boards I own but the art on it is very good, the room images are well presented and a good size. 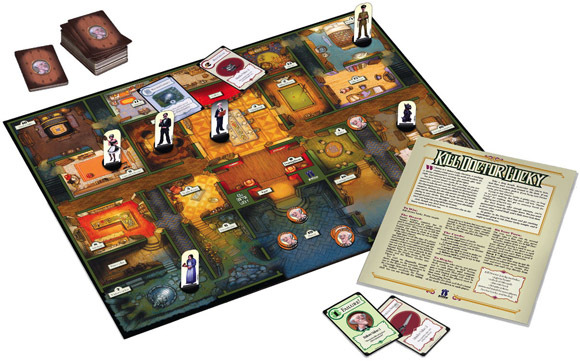 The pawns are card standees with images of the protagonists on them as well as one featuring the ill fated doctor and his little dog Shamrock, and they feature a cartoony image of each of them brandishing their weapon of choice. The maid wields her broom as if she held a warhammer, the military gentleman hefts his service revolver as if waiting for the hapless pensioner to wander into view. They are made of a nice thick card, the same used for the spite tokens, which themselves hold an image of the good doctor looking rather worried. These standees fit snugly into plastic stands which are a good size, it can be irritating when the stands are so big as to hamper the placing of pieces on the board. Finally my personal favourite part of the package, the cards. The quality is some of the better I’ve seen even if the static from the wrapping kept the cards clumping together until they had been vigorously shuffled once or twice. The images on the cards are in keeping with the rest of the artwork. The weapon/murder cards feature a simple picture of the weapon at hand and the murder score and any bonuses are clearly printed, as some weapons are better when used in certain rooms. The location cards simply have an image of the room and instructions to move either yourself or doctor Lucky there and the movement cards have the number of spaces it affords you/the doctor printed on them. The best cards are the failure cards, played to prevent the other would-be murderers from offing your target before you. The images are usually of one of the characters looking angry or the doctor looking worried/smug/confused. The humour is in the text. From discovering that your weapon is in fact a useless banana, the doctor disappearing in a cloud of feathers up to a mysterious kung fu master randomly appearing and saving the doctor at the last second. These make for an amusing game of positioning yourself for a good kill while robbing your opponents of victory with a well timed random event. In our first game the first couple of turns were a tentative affair of moving around the board, picking up a few more cards and working out how to make your move against the Doctor who wanders around a predictable path through his house. It wasn’t until the first attempt on his life that the game showed its true colours. If you have a group with an imagination and especially one with a knack for storytelling, then the act of ruining someone’s carefully planned execution with a series of random and ridiculous events becomes a treat for the whole group. Listening to your friend describe how you discover your gun is actually a banana which you eat and discard the skin, only to slip on said skin and fall down a hidden trapdoor can only bring a chuckle to all and the combinations only get weirder. Each time you are foiled in your scheme you receive a spite token, which grants +1 to any future attempts. When these build up and you are attacking the doctor with a stronger attempt on his life your fellow murderers have to do their best to stop you and combine their failures and the combinations of events that befall you become nothing but ridiculous! The game is fun for a good sized group but I can see how a maximum of 5 makes for a better game, having 6 or 7 players would make getting the doc alone and unseen all but impossible and would make the game drag on too long. As it is a 5 person game lasts 45-60 minutes and is very enjoyable. 8/10 and worth every point. The picture on the box says it all- a gang of unlikely evil-doers crowding around a clueless, carefree, rich guy. This is above all else a satirical prequel to clue. For unclear reasons everyone hates the gentle Dr. Lucky, and instead of solving his murder, your goal as a player is to do him in. However, the murderers apparently either don’t know that they all share the same goal or simply don’t want to cooperate with one another. You have to kill him before the others can do it, and you have to do it without anyone witnessing it. Spoiler Alert: most of the players will fail comically. More on that later. All of the murderer pawns start in the same room (the drawing room I think). Each player draws a card from the deck until someone manages to get a room card, and that card determines what room the good doctor starts in. All of the cards are returned to the deck. After a good shuffle, everyone gets six cards and the lucky person who drew the room card goes first. You can take one free step, and then play a movement card. Some cards let you move a certain number of steps, and others teleport you to a room. You can also opt to apply those movement cards to Dr. Lucky instead of your character. After that, if the circumstances are right, you can make a murder attempt. If you are in a named room and do nothing, you get to draw another card. At the end of everyone’s turn, Dr. Lucky moves along a predetermined path of numbered rooms. Killing this sucker is hard. First of all, you and Dr. Lucky must be in the same room. If any other player has line of sight into your room, you can’t do it. Remember, no witnesses. There are weapons that you can use and most of them work best in a certain room (a broom works best in the servants quarters for example) and if you have no weapons you can try to strangle him with your bare hands. Your opponents will play failure cards to mess you up. If you do fail, you get a spite token. These represent how mad you are after each botched attempt, and add to your attack score along with your weapons. Eventually, someone will manage to off Doctor Lucky. Reading the flavor text on the failure cards really adds to the experience. On their own, they are a little funny, but when people pile on the resulting scenarios are hilarious. It can get pretty slapstick-y. If you don’t take the time to enjoy the flavor text, it’ll take alot of the character out of the game. The whole package has a nice Scooby-Doo feel to it. The teleporting through the mansion reminds me of the chase scenes they had with the hall of doors. Originally, this game was made with bare bones artwork and looked more like a floor plan. Today, Kill Doctor Lucky is one of the more beautiful board games I’ve played. The board itself is amazing in its detail. In terms of components, the only complaint I have is that the cards look a little bland, but overall this is a great looking game with quality parts. The length of the game can be a problem. In fact, historically speaking, developers have had to tweak the game quite a bit since its release to make it more playable. We played it twice, and the first time was relatively quick and easy…the second game took around two hours. To be fair, I’m not sure how well the cards were shuffled, because I barely got any movement cards the whole game while another player got several attempts in and eventually won- but it does seem like the game can drag on once everyone knows how the game is played. Preventing someone from winning is as easy as walking into a room. I think this is solved by simply limiting the amount of failure cards in the deck. The game is in the middle of the road in terms of replay value. Sure, its a big mansion and there are lots of funny failure cards, but it seems like there are only so many ways to win. You can either camp out in a room with a corresponding weapon, roll the dice on random ambushes or just spam Dr. Lucky with strangling attempts until you rack up enough spite tokens to do the deed. Luckily, Paizo adds a bit more variety by packaging the game with its expansion, “And His Little Dog Too.” This includes several rules variants, all centered on Lucky’s little mini Schnauzer, Shamrock. I know, totes adorbs. This is family friendly enough to play with kids, but I think as kind of a pub game. You know, something to play with the guys. In any case, its a great casual game, especially for the price. I’d keep it for when you need a break from the games you’d play more regularly. This game has the unhappy distinction of being the only game I’ve ever played that I really disliked. The reason being that it has a mechanic (which I’ll get on to later) which means that not all players get to play the same number of turns, and some might barely get to play at all. The theme of the game is similar to Cluedo, but instead of solving a murder, you are trying to commit one! Players start off all together in the same room. They take turns to move, play special cards or ‘search’ to draw more cards into their hand. Doctor lucky himself moves around the board in a semi predictable fashion following the numbers printed in each room consecutively unless someone plays a special card to move him out of sequence. If DR. L moves into a room containing a player, it immediately becomes that player’s turn and the player has a chance to try and murder him. It’s this mechanic which I didn’t like as it means that some players can get ‘locked out’ of the game as they are skipped over in the turn sequence. In one game I played I only got to take 2 moves in the whole game! The game has a good quality components and a heavy dose of humour. The theme is pretty strong and definitely comes through in the rules as well as the artwork. This game would appeal to casual and family gamers but would be less suitable for more competitive and serious gamers. Many months ago I brought this game to a family get-together and 6 people decided to try it out. My wife and I had played it previously with our two neighbors. This time we added the docs dog to the mix. I do not recommend playing this with 6 or more people. It takes entirely too much time and is extremely difficult since more people are around to watch the doctor, and therefore he cannot be killed. We spent about 2.5 to 3 hours trying to do so. If your a strategist, like myself, you try and time the docs movements and set yourself up to get into a room with him alone. Once someone had an opportunity to kill him, there were so many failure cards out there it was a sure failure. I believe that night we almost went through every failure card in the deck before someone finally won. Yes, his dog added to the difficulty, but also added another element of strategy. It got to the point where everyone playing just wanted the doc to die horribly. It is overall an easy game to grasp and still fun with friends, just watch the player count. Doctor Lucky is a pretty fine board game, and its made even more fun if you add light roleplaying elements to the proceedings. Having people announce how they are attempting to kill the good doctor, and then hearing people interrupt (when they play their cards)and continue the story with how they failed, really enhances the experience. My biggest problem with this game is the same I have with Munchkin. It is far too likely that the game will end with everyone spending all their cards to thwart the most powerful player, so that the person immediately after can finish the job. The object of this game should not be to be the second best or the second most lucky, and I believe the fact that it often is hurts the game. Irreverently themed and lightly ruled, this Clue send-up requires more tactical than strategic processing, but should please the casual gamer in you. It’s also going to feel more familiar to your friends and relatives whose board game knowledge doesn’t extend much farther than Monopoly and Risk. Unless they don’t appreciate the black humor of the theme. When you do get your aunts, uncles, and cousins to sit up to the table between Thanksgiving meals, I recommend 3-5 players. My games with 6 people been inconsistently enjoyable. Too many characters on the board tends to prolong the game to the point where mere chance (and holding onto the right move card) snares you the win condition. That saps the fun from winner and losers. Also, don’t bother with “little dog” alternate rules, unless you like said dragging of a game. This is a great family game. It’s like the reverse of Clue…or maybe the prequel, as you are trying to “Kill Doctor Lucky”. It’s great fun for all ages. I recommend it. Great party game, from what seems like a really basic game because really intense at times. 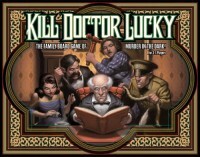 Add a Review for "Kill Doctor Lucky"